Limited each club member and one guest. They can be used between April 1st and October 31st during daylight hours. Age Limitation: You must be 16 years old or between 12 & 15 years old and within sight of parental or responsible adult supervision. Life jackets must be worn at all times in or near the water while launching or retrieving the canoes or kayaks; no exceptions. The life jacket should be the proper size for the person wearing it and it should be adjusted properly. Do not deliberately tip or capsize. Stay close to edge of the river since the canoes and sit-in kayaks will swamp and fill with water after capsizing. You should pull the canoe or kayak to the nearest edge of the river and then lift and turn it upside down to remove the water. The canoes and kayaks should be carried or carted over land. Never drag the canoes and kayaks. Kayak carts and canoe dollies are available and these devices are recommended for moving the kayaks and canoes on land and in shallow water. The canoes and kayaks should be launched from the shore. Do not launch or board the canoes or kayaks from the bulkhead, ramp or the dock because any capsize near a dock or bulkhead can result in injury. All mud and dirt is to be washed from the inside and outside after each use. The canoes and kayaks are stored on their racks. Store the blue sit-in Prodigy kayaks on the bottom level of the racks, upside down. Use the side of the rack instead of the end of the rack. These kayaks have very fragile seat backs, which are easily damaged if the back support contacts the storage rack support. Set hull on cart with hook strap towards the bow (which is the front end). Slide cart towards bow until best fit is obtained. Some flexing of the cart cradle should be present for secure mounting. Set hook at cockpit (kayak seating area) and adjust hook strap to this position using snap buckle. Run short strap around hull. Tighten short strap using snap buckle. Examine fit. Adjust if required. Both straps should be tight. 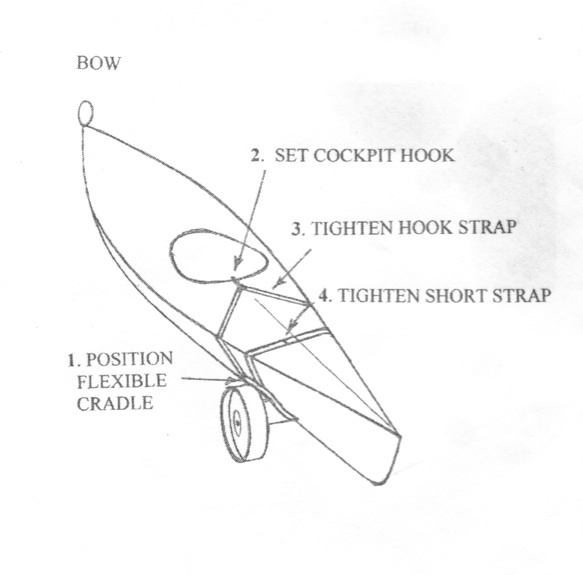 Lift bow using loop or handle. Cart should be secure on hull and can be pulled or pushed with confidence. 7) Cart removal and remount can generally be done by just snapping off the short strap thus becoming a snap on snap off operation. These carts are designed for manual transport. Do not have people in the boat with the wheels attached. Damage to the boat or personal injury may result. Have FUN!!! Thanks for your understanding and enjoy the summer at the club!